Alaska artist Ray Troll is known for blending art and science with his signature brand of quirky humor. His upcoming “The Buzz Saw Sharks of Long Ago,” an exhibit opening Nov. 5 at the UO's Museum of Natural and Cultural History, is a case in point. Combining Troll’s imaginative prints and murals with fossils and interactive displays, the exhibit unravels the mystery of Helicoprion — an ancient, whorl-tooth shark that has long been a paleontological puzzle. The Ketchikan-based Troll is famous for his fossil-filled art, which has appeared in museums and publications around the globe. Drawing inspiration from the latest scientific discoveries, Troll brings a unique, street-smart sensibility to the world of paleontology. 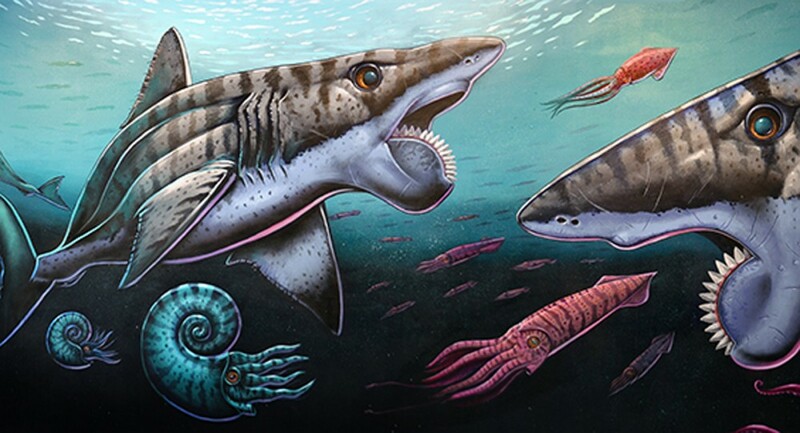 Along with several spectacular Helicoprion fossils, the exhibit includes 21 works by Troll, a 17-foot mural Troll painted in collaboration with California artist Memo Jauregui, and two life-sized models of Helicoprion sculpted by Gary Staab of Missouri’s Staab Studios. His obsession with Helicoprion, which is dated to the Permian period some 270 million years ago, began when Troll encountered one of its fossils in the basement of the Natural History Museum of Los Angeles County. That toothy vortex, which has been compared to a spiral saw blade, had stumped scientists for more than a century. Early reconstructions placed the whorl-shaped dentition outside the shark’s jaw, where it might have functioned as a defense structure. Other scientists posited that the structure was part of the tail. Still others imagined it positioned in the shark’s jaw — but upper or lower jaw was anyone’s guess. These differing ideas, along with a rich and entertaining variety of other hypotheses, inspired Troll to devote a body of work to Helicoprion. Troll eventually partnered with the Idaho Museum of Natural History to develop “Buzz Saw Sharks” as a traveling exhibit. Of the 140 publicly owned Helicoprion fossils, half are currently held in at the Idaho museum. The night before the opening, Troll will appear as November’s expert du jour at “Ideas on Tap,” the monthly pub conversation series of the Museum of Natural and Cultural History. 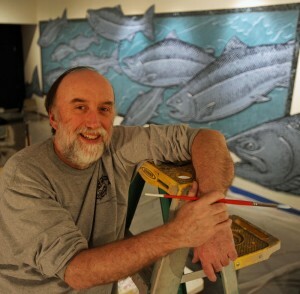 His talk “Art, Science, and One Really Freaky Fish” is set for 7 p.m. Wednesday, Nov. 4, at Springfield’s Sprout! Marketplace, 418 A St. Admission is free.